The product we have designed is a windshield treatment that reduces glare from natural and artificial lights through the use of a moth-eye diffraction grating. "In some respects, they (moth-eye gratings) behave similarly to photonic crystals, but have the advantage that their behavior is somewhat easier to predict. Designing them for the scale of a windshield would be quite a challenge, but probably possible. 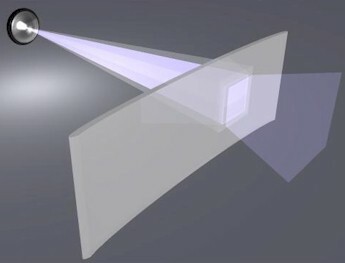 "1 Like all diffraction gratings, its purpose is to alter the behavior of light. In our case we are doing it on the nano-scale so that the treatment is invisible to the naked eye. If this application were to be prohibitively expensive, the use of eye sensors could strategically position a minimal amount of material in a specific location. Looking at the next diagram one sees the headlight of an oncoming car reaching a windshield treated with a moth-eye grating on the inside of the windshield. The intensity of the headlamp's beam is diffused so that the driver would no longer be blinded by the beam. In essence, we are dispersing the intensity over a larger area to reduce the level of intensity that strikes the eye. In this second series of pictures one sees how a treated windshield would allow the driver to see road hazards that he would otherwise be unable to distinguish if his eyes had to adjust to the glare from oncoming headlights. The embossing of such a grating would be minimally invasive to the existing manufacturing process. Image courtesy of Sean B. and Forrest R.
I - Cutting Process: Float glass is brought into the plant from a separate facility. Float glass is a large block of raw glass, that is passed along a bed of molten tin. The molten tin is dense enough to float a block of glass, thereby earning its name "float glass". The raw glass pattern is cut out, separated from the raw glass, then has the edges smoothed. After the edges are smoothed, two pieces of glass are washed and paired together. Cut: The cut area is when the glass is cut into panels that are the right size for windshields. The float glass is cut into several small panels, then further defined to the dimensions of the windshield. The excess scrap is then placed out of the way. Paint: The newly cut windshields have a black paint applied to the edges of the glass pane to keep them together and to shied the urethane glue, which holds the windshield in the car, from UV rays. II - Bending Process: The bending process is where the shape of the windshield actually takes form. Many windshields can be pressed at one time, making this a very efficient process. Lehr: The glass pieces are sent into the furnace, or lehr, for bending. The windshields pass around the furnace like a carousel. On the carousel the glass is melted to a plastic state. This glass is then bent by its own weight. The glass is finalized by having the glass pressed inside a mold to get the correct dimensions. Embossing Masters: This is where our moth-eye grating would be applied. The windshields would be sent across the assembly line to a robot. The glass is then aligned and the embossing master starts. We would apply it to the back of the windshield. After the application of the moth eye grating, the windshield would move further down the assembly line to the finishing department. Cooling: The cooling process is where they turn the lehr's power off to let the windshields cool. They must be allowed to cool at a slow rate in a controlled environment to properly anneal the windshield, minimizing the uniform stresses. III - PVB Assembly Process: The PVB process is very important. PVB makes the window legal, by keeping the windshield together in case it shatters. The PVB also holds the two pieces of glass together, making them one solid piece. Lamination: This is were PVB is added to the inside of the windshield. The two windshield pieces are lined up with a PVB sheet in the middle. The three pieces are then combined and molded together to form one piece. The Windshield is then passed onto the tacking oven. Tacking Oven: In the tacking oven the excess PVB and the black paint is trimmed from the edge of the windshield. However, the PVB in its current state is semi-cloudy. It must be sent to the autoclave. IV - Autoclave Process: The autoclave process is the clarifying process. Without this step, your windshields would be dark, cloudy, and unable to see through. Mirror Buttons: The mirror buttons are added on the inside of the windshield while in the autoclave. Autoclave: The autoclave is a heating oven that is several hundred degrees. The temperature is not hot enough to melt the glass, but is high enough to clarify the PVB inside of it. After one and a half hours, the batch of windshields are removed from the tacking oven. These semi-finished windshields are totally transparent and resemble the final product. V - Finishing: The finishing process is where all the accessories are added, including electrical wires and adhesive attachments. Inspection: Windshields are inspected and checked over to make sure all defects and abnormalities are removed from the product. Trim: This is where excess PVB is again trimmed from the glass that seeped out from the autoclave process. Attachments: This stage is were GPS systems, rain sensors, or electrical wires are attached to the windshield. Packaging: The packaging process is where the glass is stacked, boxed, and placed on trucks to be dispersed. Shipping: The shipping is the last and final process before going to the client that ordered the windshields. They go by trucks to warehouses were they are sorted by destination, reloaded to the individual routes, and sent on to the receivers. After the glass is cleaned from the autoclave, it proceeds to a robot which has the tools necessary for the embossing master. Because windshields are made in large quantities (usually 500,000 or more at a time), the robot could use a code for the geometry of each windshield configuration. These "codes" could be made by using 3D-modeling, or parametric-modeling, software such as Autodesk Inventor. The embossing process is like a large stamp. A pre-made grating is heated to large temperatures. This stamp comes down upon the windshield, and quickly stamps the moth eye design into the glass. This quickness allows it to be created at a rate of one per second, barely affecting the length of the assembly, especially if multiple Embossing Masters are used. The Stamp itself hardly ever wears, and very seldom has to be replaced, making it extremely low maintenance. As a new windshield approaches the robot, the code could be changed. For instance, you could enter the product number for that windshield, and the robot would re-align itself for the new geometry dimensions for that windshield. This can be done repeatedly and efficiently using codes for each windshield's geometry. This automated, mechanized process would help to eliminate human error and reduce the creation of scrap windshields that cannot be used and would have to be discarded. Or perhaps, the robot could be outfitted with dimension readings so that it can automatically detect when a new "style of windshield" comes through the assembly line. It could re-align the new windshield and use pre-set geometry settings to start a new embossing master. The robot could detect for itself the changes needed for each windshield configuration. Since the embossing master would be on the outside surface of the windshield, it would not interfere with the PVB laminate in the middle of the windscreen. Our nanoscale-grating would be undetectable to the naked eye and would not interfere with the windshield's everyday functionality.